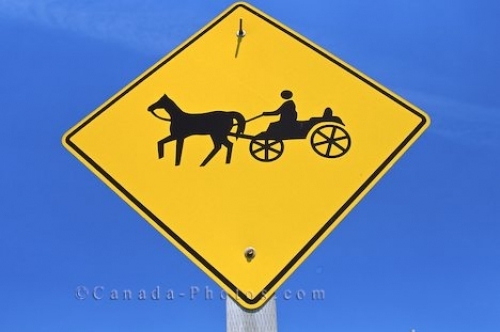 A street sign in the Mennonite village in St. Jacobs, Ontario in Canada warns people to be aware of a horse and buggy crossing the road. In the Mennonite Village in St. Jacobs, Ontario you can learn about the history, traditions, culture and religion of the Mennonite people. This street sign gives you an example of the type of life the Mennonites lead and lets people be aware of the fact that a horse and buggy may be crossing the street at any time. Street sign in Mennonite village, St. Jacobs, Ontario, Canada, North America. Picture of a street sign in the peaceful Mennonite Village in St. Jacobs, Ontario in Canada.